Today I have been playing around with MEPT beacon code on my Gadget Gangster Parallax Propeller board. First I wandered over to Jeff, KO7M's blog and borrowed his WSPR beacon code. WSPR was the thing I originally wanted to try when I decided to get the Gadget Gangster: I hadn't even heard of OPERA at that time. But I was unsure whether I would be able to generate the FSK frequencies WSPR uses: four tones separated by about 1.48Hz. Jeff decided to shoot as near as he could and programmed for a 2Hz separation of tones, and found that the signal was decoded by K1JT's WSPR program. So no problem! I measured the RF output from the Propeller board and it was somewhere in the region of 25 to 40mW, depending on which measurement method you believe. 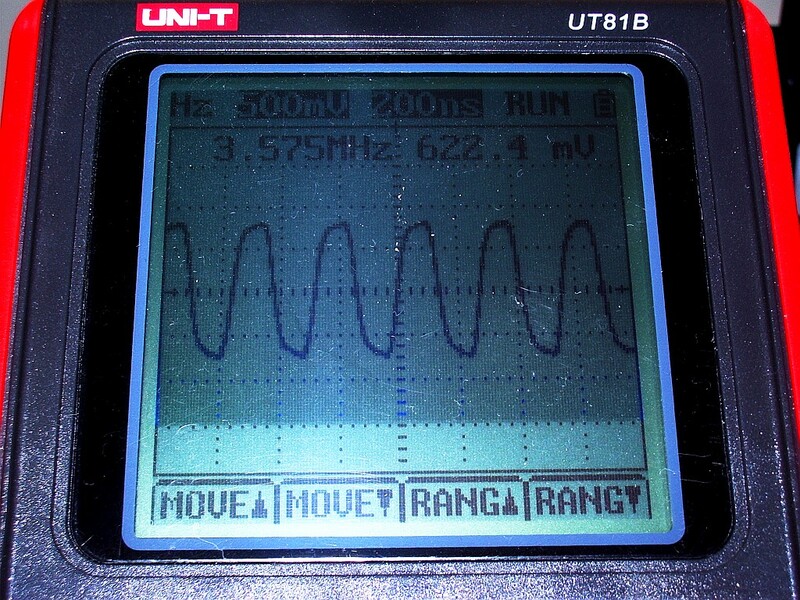 I also looked at the output using my oscilloscope. It wasn't a pure sine wave, there's obviously some harmonic content there, but it was not as bad as I feared it might be. As I would be using my MFJ magnetic loop on 30m, which has a very narrow bandwidth, I decided not to bother with a low pass filter for the sake of these initial trials. I watched the seconds tick over on my shack radio-controlled clock, started the beacon and was soon rewarded by several WSPR spots! Because WSPR is a time-synchronous mode I had to start the beacon when the seconds ticked over to 00. This brought to light a problem Jeff had already observed: the Propeller drifts. The drift seems to be worst during the first few minutes of operation, so leaving the beacon running so it can reach a stable temperature would appear to be the solution. However that is not so easy when you have to power it on at an exact time. I will need to look in to implementing a real-time clock for WSPR, unless I want to interface a GPS receiver to the Propeller - which is certainly possible and something else I hope to try as I'd like to have a go at making an APRS tracker. An advantage of the OPERA mode is that it is not time synchronous so I can leave the beacon running in that mode with an arbitrary delay between transmissions. My first OPERA transmission also produced several spots, including reports from fellow bloggers PC4T and G4NKX. I can also generate Morse and QRSS beacons using the Propeller chip. There is still a lot to do to reach my goal of a multimode, frequency-agile beacon, including adding a PA and some switchable bandpass filters. But so far this project has turned out to be easier than I thought it would. There are a number of things I'd like to do radio-wise this year. One of them is to get equipped for SSB on four metres. I have spent quite a lot over the last two or three years on 2m SSB and have very few contacts to show for it. My QTH in the Cockermouth Black Hole seems to be prevented by the Lake District mountains from receiving good signals from other English stations by normal propagation. I don't even experience much in the way of tropo openings here. The only real 2m DX I have worked are a handful of Sporadic-E (Es) contacts into Spain and Portugal. One thing I have learned is that 144MHz Es, which is a pretty rare thing in any case, is considerably rarer the further north you get. I was ill and recovering from my brain operation during the peak of the Es season last year but as far as I can tell from DX Sherlock no Sporadic-E openings on 2m reached this far north during 2011 so I didn't actually miss anything. Six metres is another matter. I have made lots of contacts on the Magic Band even though my 6m antenna is just the addition of two quarter-wave wire elements to my multi-band attic dipole. Four metres won't be open as often as Six but it should sustain Sporadic-E propagation a lot more often than Two does. And now that many European countries have granted their amateurs 4m allocations I think there could be a good chance of working some summertime DX. The plan depends on my finding space in my attic antenna farm for a 4m antenna. One of the first home improvements Olga and I will make this year is to replace the central heating boiler and we're advised that the most efficient types available now heat the water on demand and don't need a header tank or pipes in the loft. I'm a bit apprehensive about letting workmen loose in the attic when I'm not sure whether I'm capable of moving around safely up there to check my antennas are OK and repair any damage. But getting rid of the tank and copper pipes will make a bit more space for the antennas and hopefully allow me to mount a 4m Moxon on the rotator where the 2m one currently is. I will also need a radio for 4m SSB. I guess I'm looking at getting a Spectrum Communications transverter for this. Probably a ready built one as I'm not really sure I can manage to assemble that complex a kit any more. I wonder if anyone has successfully modified an Elecraft XV50 for 70MHz? Upon further investigation it appears that the site toplisted.net has become defunct and an image from amateurradio.toplisted.net has been replaced by the one shown in the screen grab. So solving the problem turned out to be a simple matter of removing the links to toplisted.net. Big sigh of relief! I don't know whether the hacked image contained any other payload. I wonder how many other ham radio sites are affected? Because of things like this, running a website is a hassle compared to the blog which is maintained and updated free of charge by the blog host such as Blogger. I'd prefer to just concern myself with the content of the site not the technical aspects. It may be time to review the future of the website, especially considering that some of the software it contains (such as VOAProp) is gradually being made obsolete by changes to the Windows OS and third-party data files. Through Eldon, WA0UWH I have discovered another blog to add to the blogroll: that of Jeff, KO7M. Jeff is interested in a lot of the same things I have been (including light aviation: an ambition of mine when I was in my 20s but which I could never afford to take up.) But what really piqued my interest was that he has just got a Parallax Propeller to generate a WSPR signal. This is one of the things I was interested in trying. But I never got further than wondering how to implement the fractional frequency shifts of the WSPR signal, which uses 4 tones shifted by just under 1.5Hz from each other. Jeff has apparently found that a 2Hz shift is good enough to be decoded, allowing WSPR to be sent using the integer frequencies the Propeller chip can easily generate. Once I have finished the Tiny Keyer project and can get back to the Propeller I will be trying this myself. 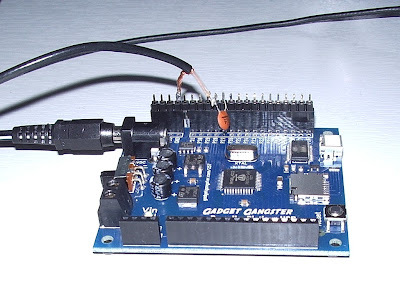 My ambition at the moment is to make a multi-band multi-mode (OPERA, WSPR and perhaps QRSS as well) standalone beacon with an LCD panel to enable me to choose the band and mode. We'll see how far I get, but having two other people working on the same ideas should certainly make the task easier! I'm sorry if you are one of the many people who have sent me email expecting a reply, but unfortunately answering emails is one of the things I very often never get around to. Although it might seem from the blog that I am getting back to normal, everything I do still takes me a lot longer than it did when I was fit and well and I'm more prone to making stupid errors. I'm happy that I'm still able to do some of my ham radio activities but what I achieve is often accomplished only after a lot of frustration. Today the Simple Keyer Chip from Steve Weber arrived in the post. I verified the behaviour of the chip I'd programmed, then replaced it with the new one. I was pleased to find that it now operated at the correct speed - the sidetone was now audible to humans rather than bats and the default speed was rather more sensible. Obviously I'd messed up some setting of the programmer - but the keyer still ignored the dot paddle. I began to suspect that this meant there was something wrong with my wiring, but between my limited field of focus and my shaky hands it took the entire morning - culminating in a lot of bad language - before it eventually dawned on me what was the trouble. To cut a long story short, the cause of the problem was the 3.5mm socket I was using for a key jack. It had three terminals which I thought were for tip, ring and sleeve, dash, dot and ground. But it was a mono socket! There was no ring connection. One of the three terminals was linked to the other and disconnected when the plug was pushed in, intended to silence a speaker when phones were plugged in. It took me an entire morning including checking the wiring of two morse keys before I discovered my stupidity. I hunted in my parts drawers and eventually discovered a proper 3.5mm stereo socket. After connecting that in place of the other one I confirmed that the keyer worked as expected. But the frustrating search for the solution had made me tired so I decided to leave the task of drilling the box and finishing the keyer for another day, thereby adding to the list of unfinished tasks alongside the unanswered emails. Another thing that annoys me is my Rapid Electronics HY3003D bench power supply. It has a rather inconvenient fault for a power supply that is used in a radio shack. The voltage regulation circuit suffers from RFI. If any of my radios transmits, the voltage increases. In some cases it could increase to a level that could damage the circuit I am testing, though fortunately that hasn't happened yet. There's a lot of excitement right now in the UK tech community about a new computer called the Raspberry Pi. It's a bare board computer with an ARM processor that runs Gnu/Linux that is expected to sell for $25. It's aimed principally at the education market with the intention of getting schools to teach students how to program and build things with computers instead of just learning Word and Excel as they do now. The Raspberry Pi will soon be available for anyone to buy. When they are, I'm tempted to get one. 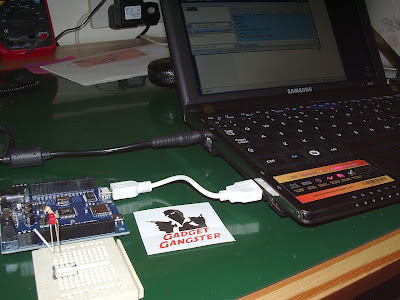 My recently acquired Gadget Gangster has helped me recapture some of the magic and excitement I felt when I first started dabbling in home computers back in the '80s with things like the Nascom 1, ZX81 and Sinclair Spectrum. I think the Raspberry Pi would do the same. PCs and Windows are great tools, but they have turned computers into appliances and made computing boring. Microcontrollers are like QRP computers - more of a challenge to use but when you succeed you feel a real thrill at having accomplished something. I think there has never been a better time than now to have an interest in electronics. I hope the Raspberry Pi is a huge success. Perhaps it will result in more of our young people becoming engineers instead of wanting to be lawyers or salespeople. Paul PC4T may be taking a rest from blogging but he is still active. Yesterday evening I spotted him using the new Opera mode. Andy K3UK has prepared a quick guide to using Opera which some may find helpful. As he points out, Opera is not a QSO mode. The only information that is sent in a beacon transmission is your callsign. Other information that is displayed in the software such as QTH, distance and bearing is sent over the internet back-channel by connected software clients. Eldon WA0UWH has taken the Parallax Propeller code from my previous post and tried it out on the air. He has already received several reception reports. Before I can do the same I will need to build a small PA / LPF with an output in the range 200mW to 500mW. Hopefully I can find a suitable circuit that uses standard components such as 2N3904 or 2N2222 which I have in my parts box. Suggestions welcome. I modified Eldon Brown WA0UWH's QRSS program code to send the bit code generated by the Opera software and it was received by my K3 on 30m and successfully decoded. Not bad for 5 minutes' work! You can download the code here. 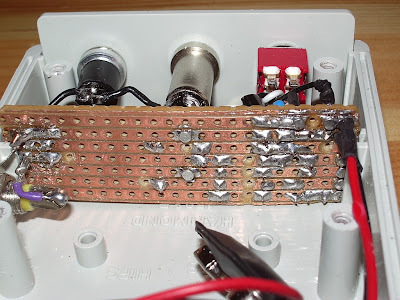 Just as Eldon did I will have to build an amplifier to raise the output of the Propeller from a couple of milliwatts to something with a better chance of being received. Before it is worth doing that people will have to start using the Opera mode on the HF bands because with my antenna restrictions I have no hope of receiving or radiating a signal on LF or VLF. But I am quite excited at the possibility of building simple standalone beacon transmitters for this new weak signal mode which is much easier to generate than WSPR or QRSS. Stop press: Just decoded G0NBD on 10.135MHz +1500Hz for my first real over-the-air Opera spot. And it appears my first transmission (using the PC software and my K3 at 5W) has been received by OM5NA at -21dB. This is fun! Nothing to do with Verdi or Rossini, nor the web browser of the same name. OPERA is a new weak signal digital mode that has been developed for use on the amateur LF (500kHz) and VLF (136kHz) bands. Information about it seems to be a bit hard to come by, but there is an OPERA Yahoo group from where I presume you can download the latest version of the software. I managed to find a copy and was surprised at the sophistication of the program. It already has working CAT support for many transceivers including my Elecraft K2 and K3. It also has a built-in chat system showing reported signals from other users. Although the new mode is apparently the invention of Graham, G0NBD, the program has been written by Jose Alberto Ros, EA5HVK, author of the ROS digital mode, and there are clear similarities in the user interface. The program supports all amateur bands from VLF to 6m but currently you can only select the frequencies 136kHz and 500kHz. There are actually two OPERA modes, one of which is claimed to be even better (i.e. work with even weaker signals) than the WSPR mode. What is particularly interesting about OPERA though is that it does not need to use a sound card to send a transmission. Although the sound card is an option - and a convenient one for users already set up for data modes - OPERA actually (if I understand correctly) uses on/off keying, in other words CW (though not Morse code.) 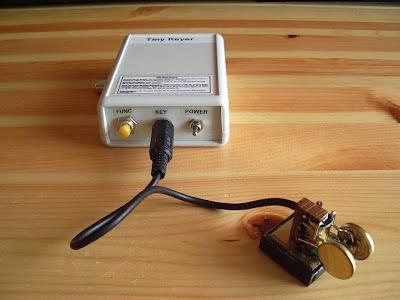 This offers the potential for long distance contacts to be made using ultra-simple QRPP (very low power) transmitters designed for QRP CW use - though I imagine that success depends on use of a very narrow bandwidth so you might need to pay more attention to transmitter stability than you would need for Morse code.) If the digital encoding scheme is published then it would also be simple to build microcontroller based beacon transmitters. As I am not equipped to operate on the 500kHz or 136kHz bands I have been unable to try OPERA out on the air myself. 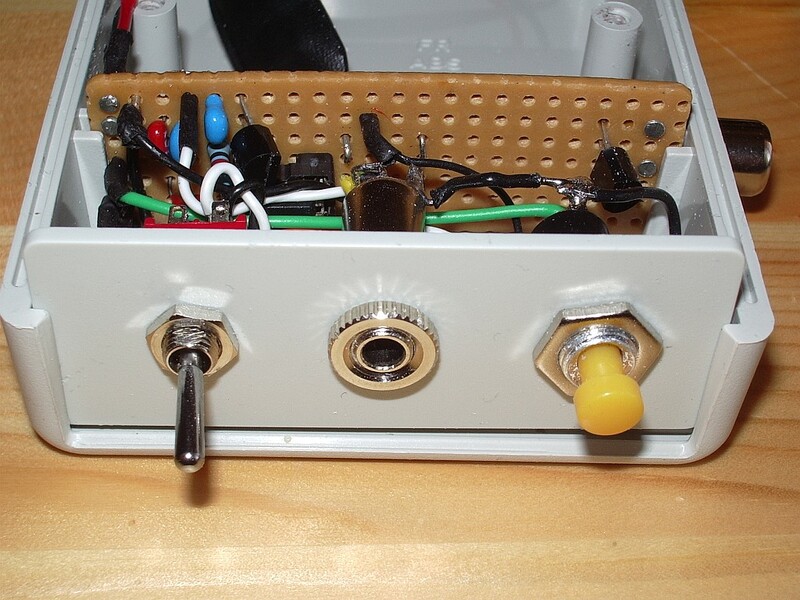 But it certainly looks an interesting mode, especially if it is opened up to allow use on the HF bands where it could be used as an alternative to WSPR and QRSS CW modes. A new toy dropped through the letterbox today. 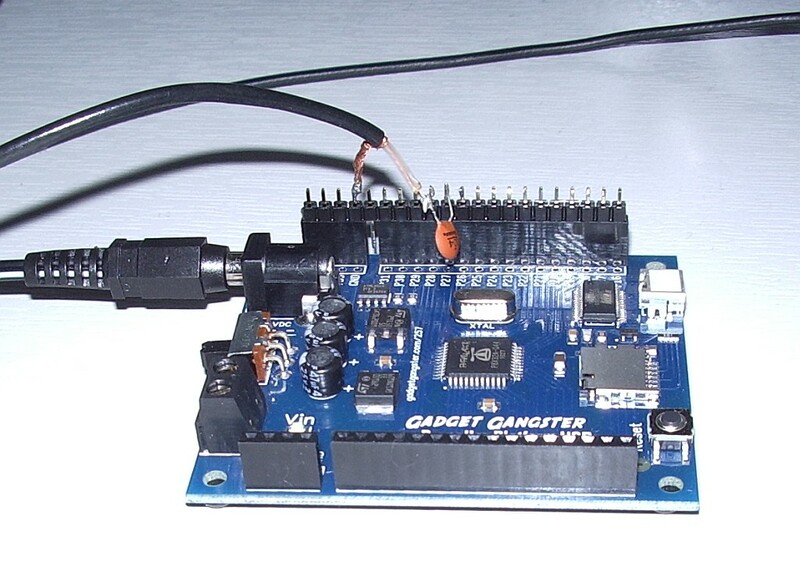 It is a Gadget Gangster Propeller Platform USB demo board for experimenting with the Parallax Propeller microcontroller. 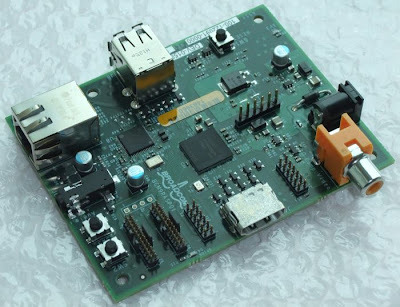 If you haven't heard of the Parallax Propeller before then it is an inexpensive micro chip that contains eight processors called cogs (as in gear wheels) that can run independently in parallel. It's quite a bit different from the Microchip PIC or Atmel devices which have a single processor architecture similar to an ordinary computer. I sent off for the board just after Christmas, after reading about it in Eldon Brown WA0UWH's blog. Eldon posted code showing how the board could be used as a QRSS beacon. 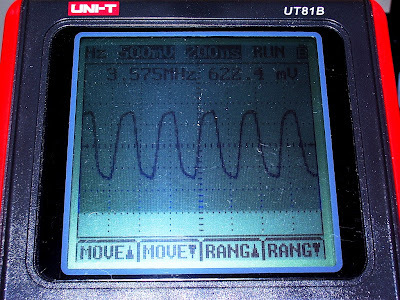 I was quite excited by the idea of a device that with simple programs even I could understand could be made to emit RF. I sent off for the board on 27th December choosing the low cost untracked USPS air mail shipping option and it arrived today, 4 January - much quicker than expected. What's more, there were no nasty customs charges! Gadget Gangster still has a special offer of $10 off for the board, so if you fancy getting one of these to play with now is the time to do something about it. I was very impressed at the speed with which Gadget Gangster processed my order. What you get, though, is just the board. You will need to provide a power supply (7.5 - 12V with a 2.1mm barrel connector, centre positive) and a USB cable with a mini-USB jack at one end. These seem to breed in my junk box so that was not a problem. You will also find useful a small breadboard and some hookup wire to attach components to the board and test your programs. Over the next few days I'll be working through the tutorials to get the hang of the system. Then I'll take a look at Eldon's QRSS beacon code and adapt it to send my own call. I'd like to make a WSPR beacon. I don't know yet if that will be possible, but I'm looking forward to playing with this Propeller chip and using it in some radio-related project. Watch this space! I checked WSPRnet.org this morning and found quite a lot of activity on 10m so I fired up the K2 and joined the fun with a 1 watt signal. By late afternoon I'd had well over 40 unique call / spotter combinations including good reports from FR1, VK6, VE and the USA. At lunch time I switched to the K3 (which has a mic attached) to make some SSB QSOs. This was not especially productive. Several US stations running high power to multi-element beams were huge signals over here, but they had huge numbers of European stations calling them and my 100W to an attic dipole had trouble being heard over them. Actually I was only using 80W as I found going up to 100W on 10m caused my homebrew digimodes interface to disconnect itself from the computer. When I was heard, I received good reports from N2JF and NU1O. Perhaps I'd have made more contacts if I'd called CQ. During my WSPR session I saw that my signal had been spotted by a callsign that rang a bell: G4HBA. A quick look at qrz.com confirmed that my memory was correct: G4HBA was Roger who had also been G8KRT some 35 years ago. During the long hot summer of 1976 when I was G8ILO and only allowed to use 2m and up I was home from university and using an Icom IC-202. Roger was portable from near his place of work in south east Essex and working strings of Continental stations during the endless tropo openings. As I had no antenna at the parental QTH I drove out to find him and on several days I joined Roger and made some contacts under my own call. One evening I drove out to the site and Roger was not there, so I went to the top of the hill and started operating using my IC-202 and a small beam I made that was supported by the car door. After about half an hour it was getting dark and I noticed torches moving about and closing in on the car. Suddenly I was surrounded by police in uniform! Apparently my car interior light had been spotted from several miles away (as I was on top of a hill) and as I was right next to a radar station someone had wondered what I was up to. That was the end of my operating from that particular site, but I will always remember the amazing VHF propagation of that summer and regret that I never experience such conditions on 2m here. In 2012 Yaesu will introduce a range of digital voice radios to the amateur market. They have published a Digital Communications Guide for Amateur Radio Operators that describes their new system and answers some questions about it. Yaesu's offering seems to be compatible with Motorola's professional digital mobile radio system, which offers hams the possibility of a second source of compatible equipment on the surplus market - not that used professional Motorola radios have ever been cheap. But the Yaesu system will not be compatible with D-Star. No surprise there, then. I have always believed it was a foolish move for ham radio organizations like our RSGB to allow themselves to be bamboozled by Icom into permitting the creation of a digital network that gave one supplier a monopoly. Repeater groups and their members who have made substantial investments in D-Star technology are not going to want to switch to a different digital mode that makes existing hardware obsolete. On the other hand, D-Star itself is becoming an outmoded technology in digital terms. Hams who have been sitting on the fence looking for an up to date alternative that doesn't involve buying Icom are not going to plump for one system or the other while the future looks like being fragmented into rival factions. It will be like the video war between VHS and Betamax. 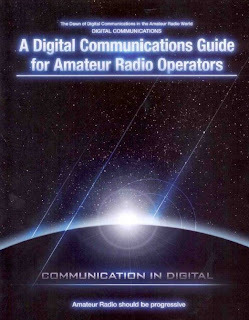 I think Yaesu's announcement will kill the already lame duck of D-Star and ensure that analogue FM remains the dominant mode on the amateur VHF bands and up for years to come.